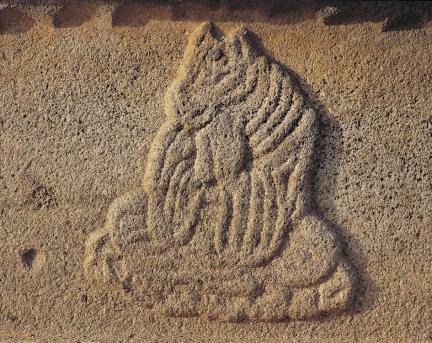 고려 전기에 창건된 개심사에 있던 탑이었으나, 절터의 흔적은 찾아볼 수 없고, 현재는 논 한가운데에 서 있다. 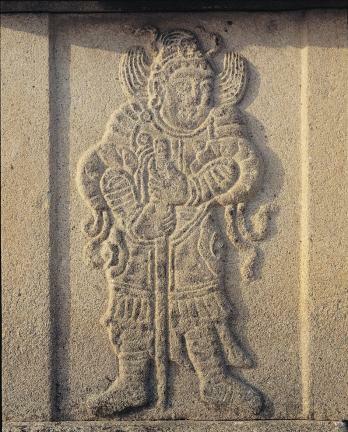 탑은 2단의 기단(基壇) 위에 5층의 탑신(塔身)을 세운 모습이다. 아래층 기단은 4면마다 둥근 테두리 선을 새기고 그 안에 머리는 짐승, 몸은 사람인 12지신상(十二支神像)을 차례로 조각하였다. 위층 기단은 4면의 가운데에 기둥 모양을 새겨 면을 나눈 다음 그 안에 팔부중상(八部衆像)을 새겨 놓았다. 팔부중상은 불법을 지키는 여덟 신의 모습을 새겨놓은 것으로, 통일신라와 고려에 걸쳐 석탑의 기단에 많이 나타난다. 기단의 맨 윗돌은 그 윗면에 몸돌을 받치기 위한 연꽃무늬의 괴임돌을 놓았는데, 이것은 고려시대 석탑양식의 한 특징이다. 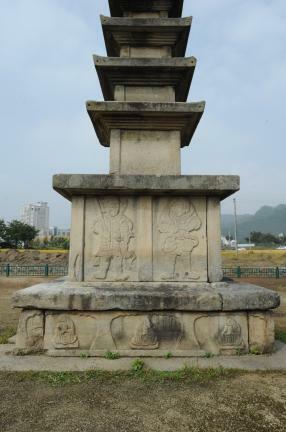 사리나 법경을 봉안하는 탑신부는 몸돌과 지붕돌이 한 돌로 되어 있다. 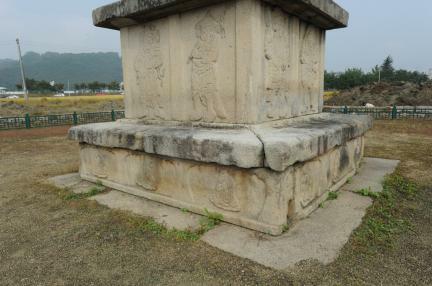 1층 몸돌에는 문고리 모양을 조각하고 그 좌우에 인왕상(仁王像)을 새겨 두었다. 지붕돌은 밑면에 모두 4단씩의 받침을 깎아두었으며, 네 귀퉁이에서 살짝 들려있어 탑 전체에 경쾌함을 실어 준다. 기단에 남겨진 기록을 통해 고려 현종 원년(1010)에 세워진 탑임을 알 수 있다. 전체적으로 체감률이 매우 온화하여 좋은 비례를 보여주는 아름다운 탑이다. 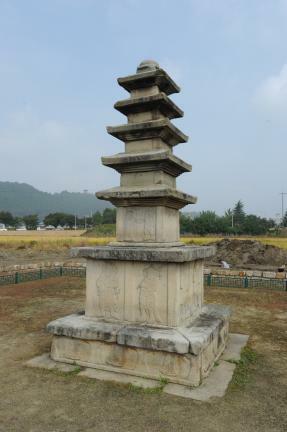 This five-story stone pagoda, standing in the middle of a rice field, was originally erected at the long-since-disappeared Gaesimsa Temple during the early days of the Goryeo Dynasty. 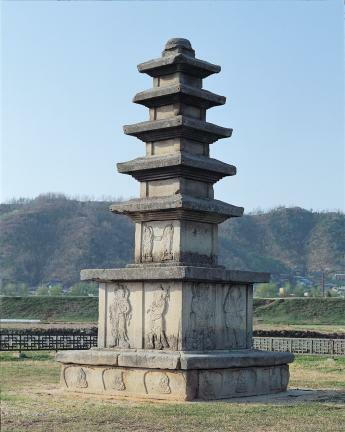 According to the inscription on the stylobate, the pagoda was built in 1010 (the first year of the reign of King Hyeonjong of Goryeo). 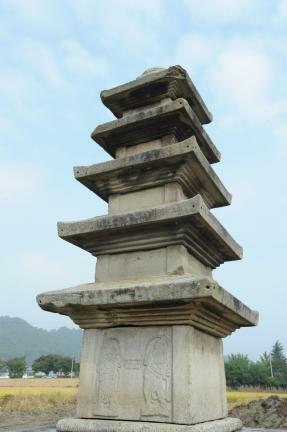 The pagoda is composed of a five-story main body and a two-story stylobate. 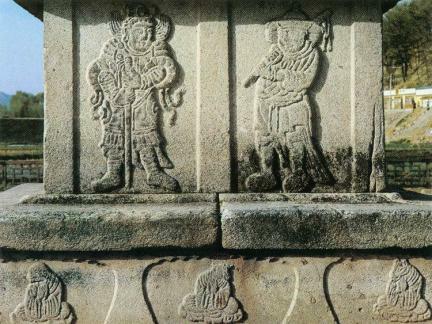 The bottom tier of the stylobate is engraved with round frame lines on each of its four sides, on which images of the twelve animals of the Chinese zodiac, composed of animal heads and human bodies, are carved in order. 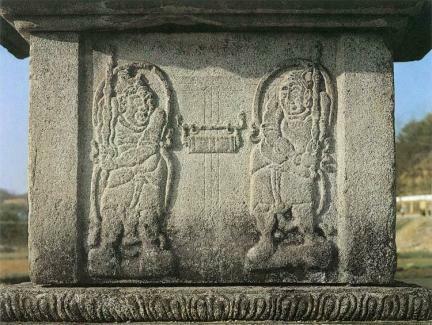 Each of the four facets of the upper layer is divided into two spaces, and each space is decorated with one of the Palbujungsang, i.e. 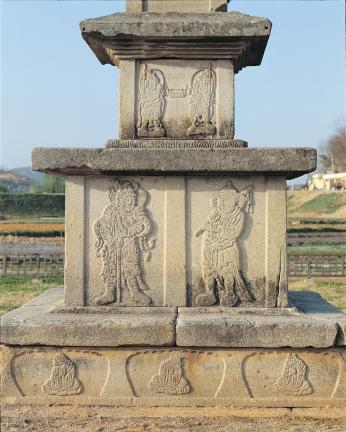 the eight guardian deities of Buddhist law who frequently appeared on the stylobates of stone pagodas of the Unified Silla and Goryeo Periods. 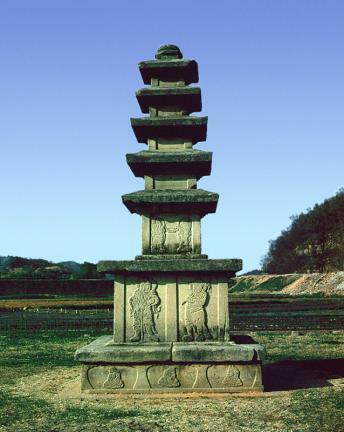 The pagoda retains a characteristic feature from the Goryeo Dynasty whereby a prop with lotus flower patterns is engraved on the surface of the upper layer of the stylobate. 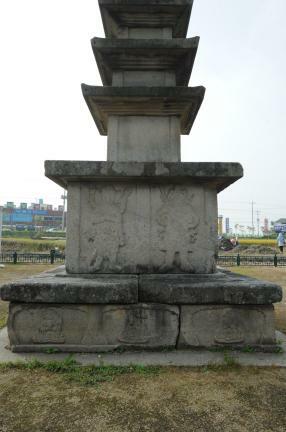 The main body of the pagoda, which generally enshrines a sarira or Buddhist scriptures, consists of one piece of stone topped with a roof stone. 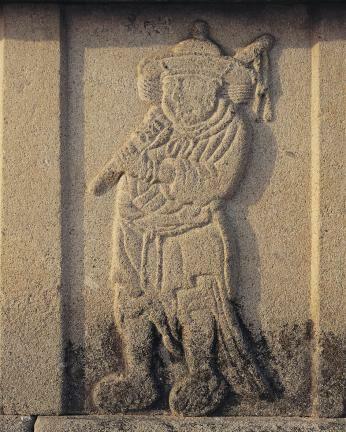 The middle of the core stone of the first story is engraved with a door handle design, flanked on both sides by an image of a Buddhist Guardian called an Inwang. 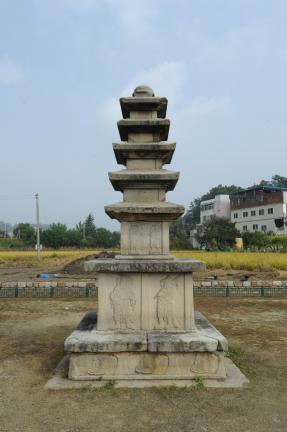 The roof stone has a four-tier cornice and curves slightly upward around the four corners, giving the pagoda an airy appearance.